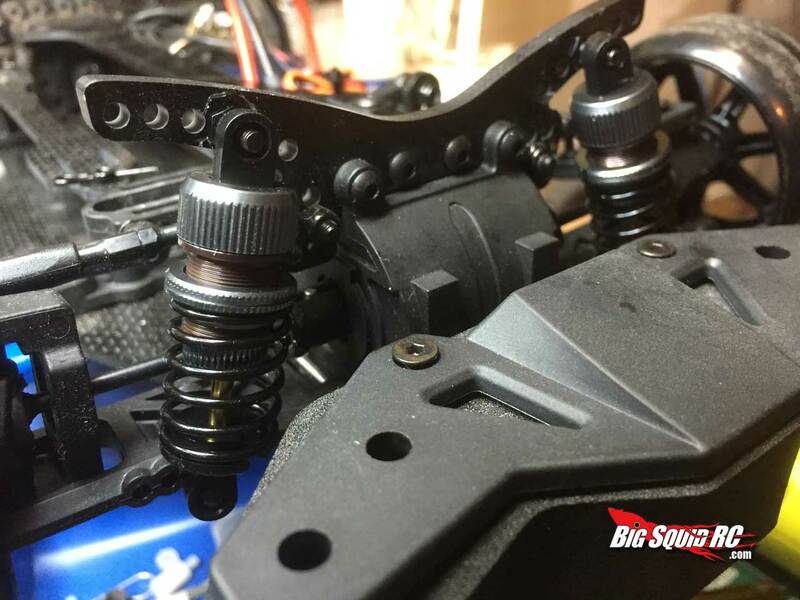 Product Spotlight – Yeah Racing Shock Gear aluminum damper set « Big Squid RC – RC Car and Truck News, Reviews, Videos, and More! 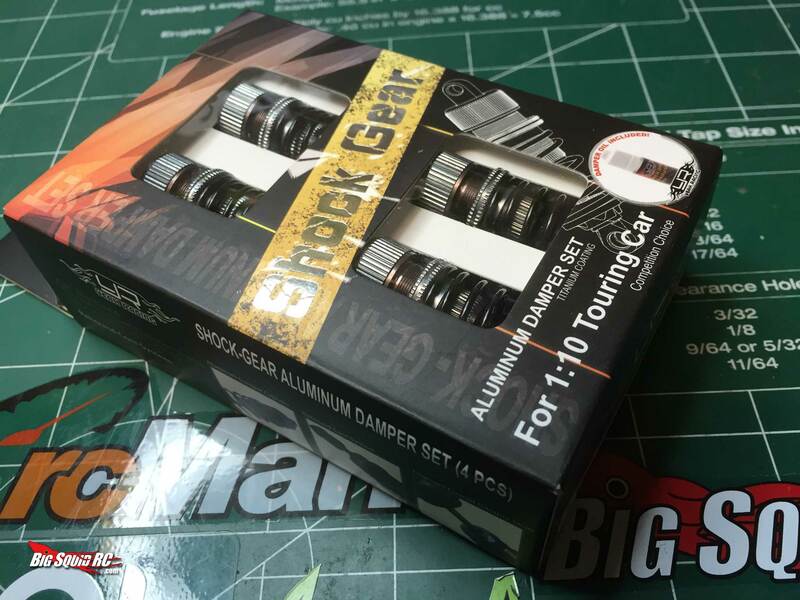 The Yeah Racing Shock Gear aluminum dampers are a low cost suspension tuning set for your 1/10th scale drifter or touring car. Low cost doesn’t mean low quality however. Just looking at the packaging you can tell that they mean business. 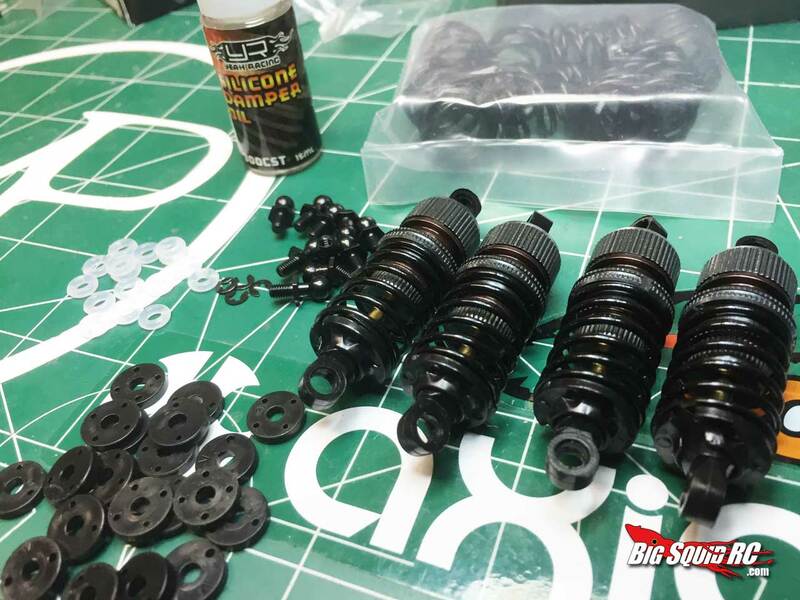 This sub 30 dollar set of shocks includes four anodized threaded aluminum dampers, five sets of springs in different rates, six sets of pistons for different dampening characteristics, titanium nitride coated shock shafts and several sets of o-rings. Also included is full mounting hardware and even a bottle of shock oil. You get a lot for your money here. As mentioned above this is a suspension system and the tuning options are numerous. Three of the sets of the pistons feature a V shaped channel (designated by a V etched into the piston) in the vents to tune the amount of compression or rebound. 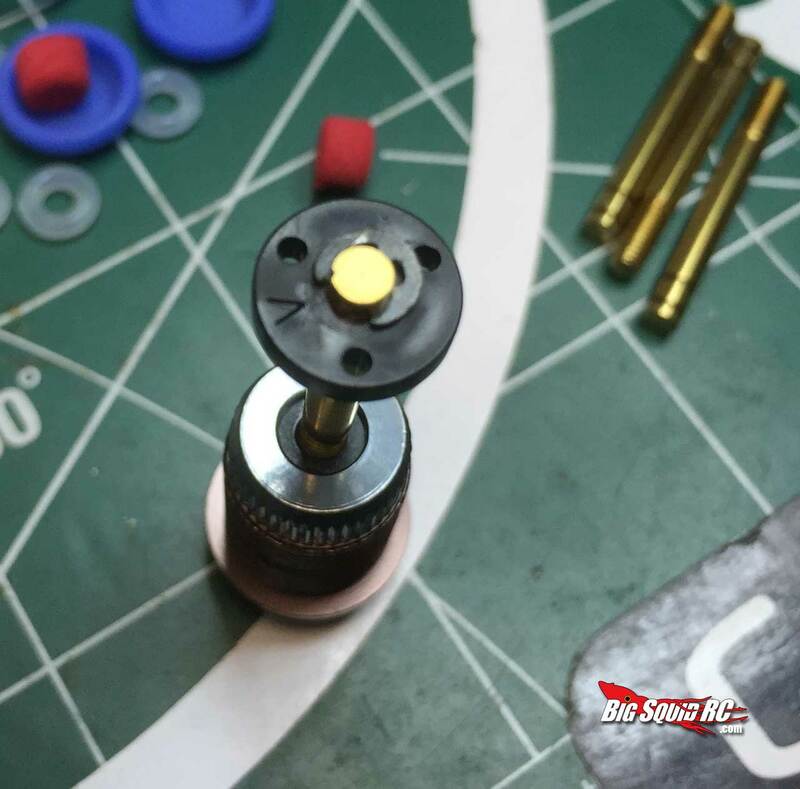 If you like quick compression and slow rebound or vice versa you can orient the piston to achieve just that. This is referred to by Yeah Racing as the Core Rebound System. Pair that with all of the spring choices and an assortment of shock oils and you can tinker to your hearts delight. The pistons appear to be molded plastic as opposed to machined as in higher end shocks but I could not find any real imperfection with them. They look very precisely built and perform as well as can be expected. 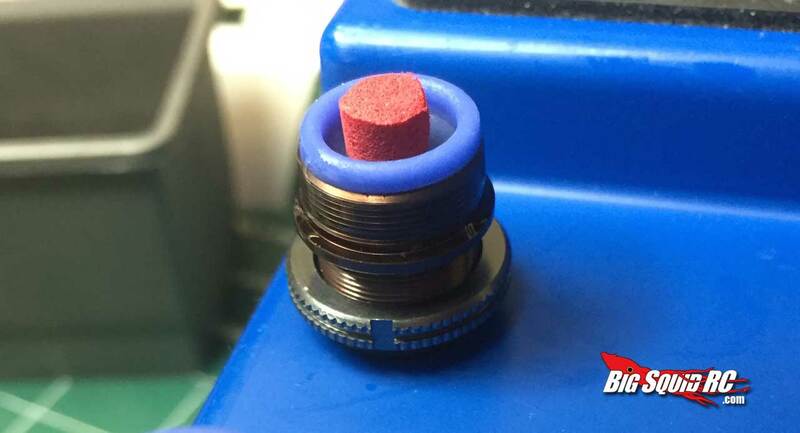 The threaded collars feature o-ring inserts to keep them from walking on you while driving and operate very smoothly when its time to adjust preload. 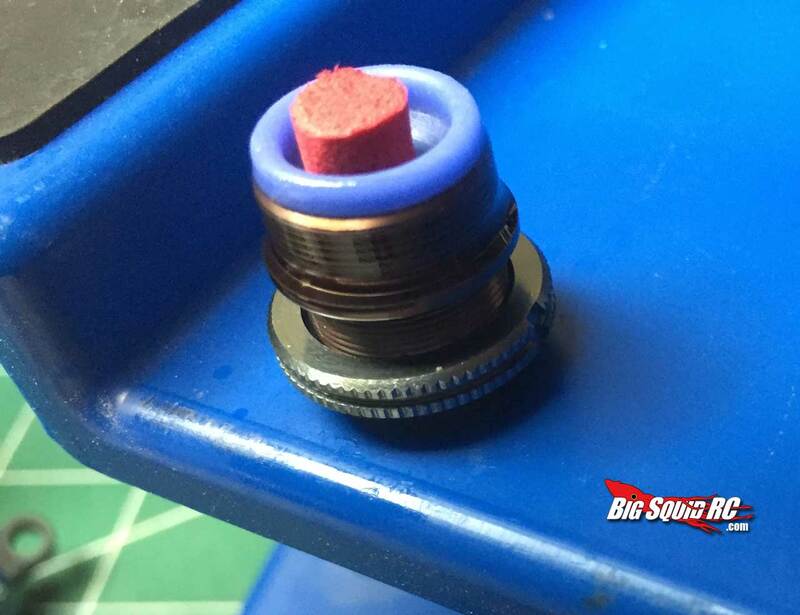 They also feature a bladder and urethane bushing to help with rebound and are extremely smooth thanks to the titanium nitride coated shock shafts. 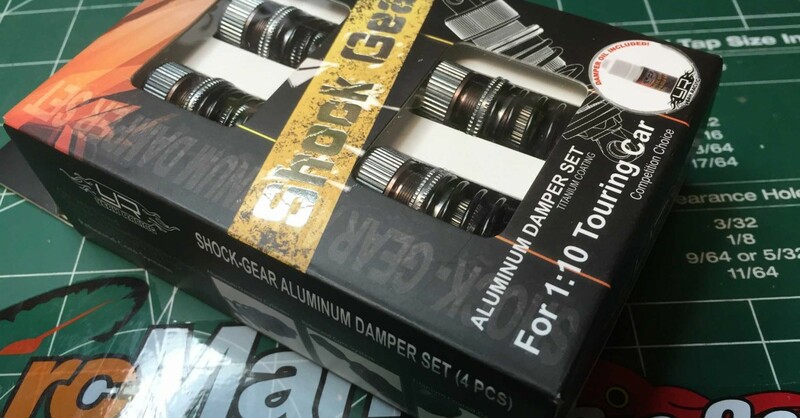 These Shock Gear dampers pictured are the 50mm versions, but they are also available in 55mm. They come in three color choices; gunmetal, blue and pink (dare I say Sakura D3/D4 pink? ), and they come as a kit so you must assemble and make your initial tuning choices before you can use them. The finish on them is very attractive and the hard anodized shock body really gives a look and feel of much higher priced units. Once I had mine built I threw them on my R31house GRK Global so I could give them a good flogging. The first thing I noticed is they are very short compared to the stockers. I think the 55mm would have suited this application much better, but a few twists on the shock end and I had the length I needed. The stock mounting hardware had to be replaced with the YR units as the diameter of the ball mounts was much different. All of the new mounting hardware went on perfectly and I had my new dampers mounted up in a matter of minutes. I stepped back to admire my work and observed that my GRK was slammed harder than a 93 Honda Civic on a used car lot. The supersoft springs really were super soft! I went up a couple of spring rates until I found my preference in ride height and stiffness. The included shock oil feels a little underdamped at this spring rate, but should serve for the smooth surface of my test track. I tend to run my suspension setups on the soft side anyway due to my rally car driving style so the initial setup suited me pretty well. I pitched the car into corners slowly and I flung it swiftly. The suspension always felt composed and did not demonstrate anything unpredictable. I ran the car across the curbs a lot to see if I could feel any difference with the Core Rebound setup and I can’t really say I felt anything strange. The suspension maybe felt a little more compliant when harshly taxed but it could also be my imagination. I’m probably not a good enough driver to really exploit the possibilities with this setup, but there certainly were no adverse effects from installing these shocks. One thing I can say for sure is that typically when I throw a car down I havn’t driven for a few weeks it takes me a bit to warm up with it. During my test session I was in the zone almost immediately which usually does not happen when switching from CS to 50/50. Read into that what you will but I would credit some of that to the suspension setup. So whats to be gained by switching to this setup? Well in my opinion if you already own a high end drift car the shocks are usually already fantastic. These are a great budget option if you have an entry level car and want to upgrade without breaking the bank. The quality is certainly on par with the MST and Yokomo shocks I am familiar with. The coated shock shafts will offer smooth action and long life by reducing friction so you will get improved performance there. The sheer volume of tuning options this setup gives you is great if you don’t have any spring and piston options with your current rig. I also like all of the spares included so will not have to go hunting when it comes time for a rebuild. I don’t have any major complaints, but there are things I would have liked to see. Since this is a suspension system that is marketed as a premium product it would have been nice to have a case or some kind of caddy to hold the components. 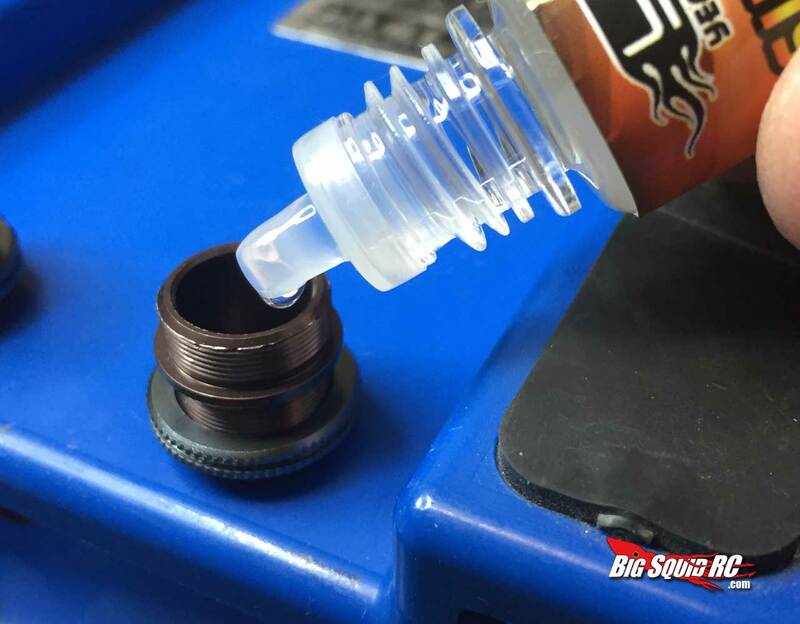 Having all the pistons and springs rolling around your pit box is a sure way to misplace some of the smaller bits and get your o-rings dirty or damaged. If this setup were packaged with Yeah Racings ride height/droop gauge, and had storage and sorting options for the pistons and springs I think people would be falling all over themselves to get these. It truly would be an all in one suspension system. That’s just this drift nerds opinion. At the price you really can’t go wrong with these. 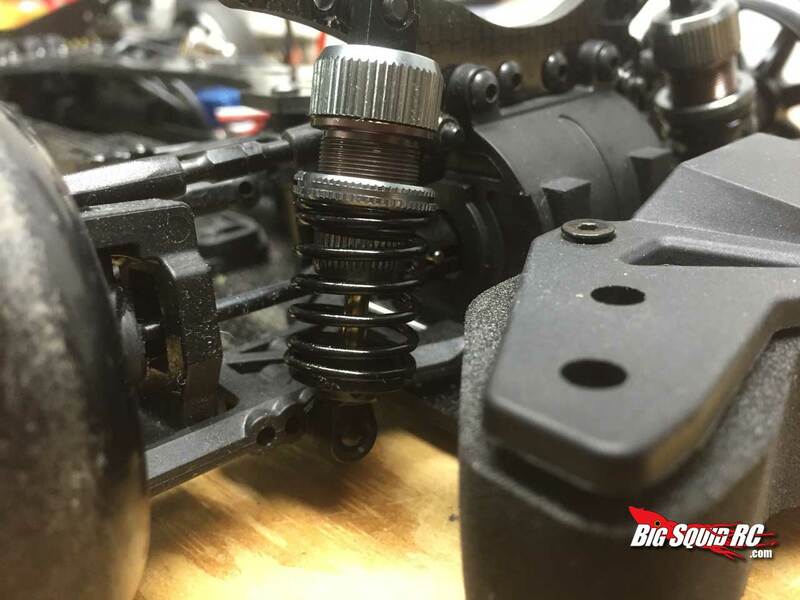 I would measure your current shocks eye to eye and select between the two sizes accordingly, but simply changing out the shock end on the shock shaft would resolve any length issues you might have. I like the look and the feel of these shocks. 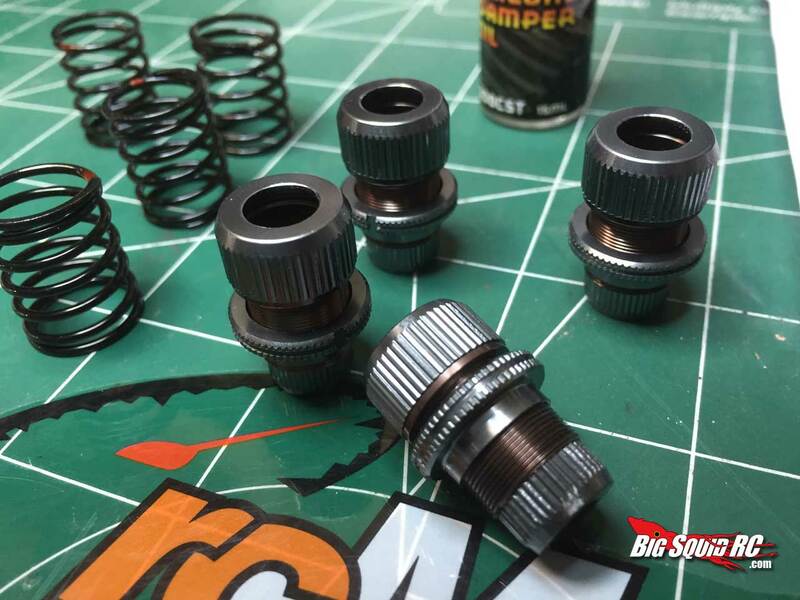 Knurled shock collars, silky smooth action, nice anodizing, tons of tuning options. What’s not to like? I think the 23 dollars RC Mart sells these for is a smoking deal for what you get. If you’re in the market i’d check them out for sure. Thanks for reading gang, catch you on the next one. If you would like to pick up a set now you can find them at RCMart right here.